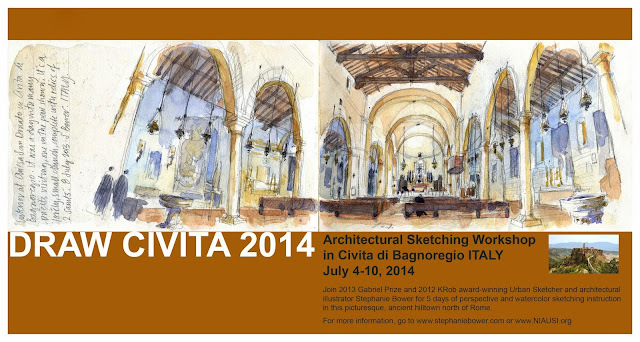 The details have been finalized and it's official--I'm so fortunate to partner with NIAUSI to teach a 5 day architectural sketching workshop in the incredible, ancient hill town of Civita di Bagnoregio, Italy next summer! ...small groups, lots of one-on-one instruction, focus on thoroughly understanding and using perspective, intro to watercolor, great food, use of the beautiful fully-restored and furnished NIAUSI apartments, Etruscan caves and Roman stone, the glorious colors of Italy in the summer, and one of the most dramatic settings on the planet...so inspiring! For more information, go to www.stephaniebower.com or drop me an email. Ciao!! !